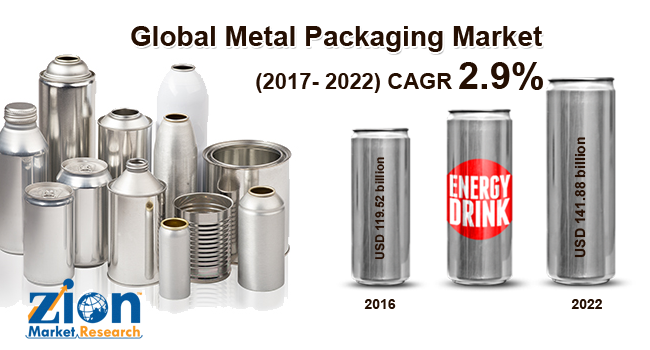 With the presence of a large pool of participants, the global metal packaging market is displaying a highly competitive business landscape, finds a new research report by Zion Market Research (ZMR). Crown Holdings, Amcor of Limited, CPMC, Ardagh Group, Bericap Group, Emballator Metal Group, Fujian Fuzhen Metal Packaging Co. Ltd., and Alcoa Incorporated are some of the key vendors of metal packaging across the world. These players are focusing aggressively on innovation, as well as on including advanced technologies in their existing products. Over the coming years, they are also expected to take up partnerships and mergers and acquisitions as their key strategy for business development states the metal packaging market study. Citing an instance, in September 2018, Mondelez International Incorporation—a U.S. based confectionery, food, and beverage firm—and Crown Aerosols and Specialty Packaging Firm signed a partnership pact to develop a limited amount of tin packaging for its Cadbury Roses chocolate products in the UK on the eve of Mondelez’s 80th anniversary. Reportedly, the objective of the packaging is to focus on brand’s longitivity through the creation of collectable tins duo that is likely to match its heritage brand. As estimated in this report, the global metal packaging market stood at US$ 119.52 billion in 2016. Witnessing a tremendous rise during the period from 2015 to 2021, the revenue in this metal packaging market is expected to reach US$ 141.88 billion by the end of the forecast period. The main types available in this metal packaging market are cans, barrels & drums, caps & closures and others. Among the three, the demand for cans is relatively higher and the trend is anticipated to remain so over the next few years, notes the research report. “Changing life patterns and increase in purchasing capacities of the end-users has created lucrative demand for metal packaging market,” says the author of this study. Apart from this, improvement in living standards of the global population and massive demand for food & beverages is expected to carve a profitable roadmap for metal packaging market over the years to come. In addition, the meteoric rise in urbanization and wide consumption of packaged food products is likely to benefit the metal packaging market within the next few years. Shifting consumer preference towards plastic as well as flexible packaging along with volatility in the raw material costs, however, are predicted to pose a threat to the metal packaging market elevation. Nevertheless, the emerging e-commerce sector along with extensive research & development activities witnessed in metal packaging manufacturing, materials, and design are predicted to boost metal packaging market trends. This, in turn, will not only minimize the impact of hindrances on the metal packaging market but also expand its scope in the near future. Regionally, Asia Pacific has been leading the worldwide metal packaging market and is anticipated to continue on the dominant position in the years to come, states the metal packaging market study. Rapidly evolving lifestyles and rise in the per capita income of the consumers are the key factor behind the dominance of the Asia Pacific metal packaging market. The high number of market players being headquartered in the Asia Pacific is another significant factor that is supporting the growth of this regional metal packaging market. For the record India and China are likely to be the key regional revenue generators during the forecast period.